TWO GOLD RINGS FOR BRIAN WALSINGHAM, THIS WEEK! New Orleans, LA (May 15, 2011) – Its poker’s equivalent of the two-minute warning, the bottom of the ninth inning, and the 18th green. Harrah’s New Orleans is the fifteenth and final WSOP Circuit stop of that season, which began nearly nine months ago. And now with just three more poker tournaments remaining on the 2010/2011 season that had a total of 154 events, the final bell is about to be rung. Indeed, Harrah’s New Orleans has been jammed to full capacity since the very start as eight of eleven gold ring tournaments have now been completed. The previous day’s tournament, which was Event #7, attracted the biggest poker turnout in six years – at 646 players. The latest event, a $1,085 buy-in No-Limit Hold’em event attracted another impressive crowd as 356 players posted the entry fee. Last year’s turnout for this same event was 216 players, so this year’s attendance smashed the previous mark by more than 50 percent. It’s easy to understand why The Big Easy has been the final WSOP Circuit stop for poker players during each of its seven seasons. Aside from world-class restaurants, great music, and a unique culture that can only been found in the Crescent City, the last week has shown that the poker action in New Orleans is pretty spectacular, too. This tournament -- officially classified as Event #8 -- generated a prize pool totaling $341,760. The top 36 finishers collected prize money. All those who cashed could take some extra pride in making the money. Given that there were so many top-flight Circuit players chasing points packing the tables, this was arguably the toughest event of the entire season. It was a lineup stacked with many of the top players of the season. A complete list of all players that cashed in EVENT #8 can be found here. The winner was Brian Walsingham, from Atlanta, GA. He collected $78,604 for first place. If Walsingham’s name sounds familiar – it should. He is enjoying a stellar run here in New Orleans. This was his second gold ring victory this week following a dominant win in Event #4 – a $355 buy-in No-Limit Hold’em tournament. The previous event attracted a 423-player field. Walsingham now owns two gold rings, which is the ultimate symbol of achievement awarded for winning a WSOP Circuit event. He also earned another 50 points towards qualifying for the WSOP Circuit National Championship. Now with 120 points, he is a virtual lock to be one of the 100 finalists. This was Walsingham’s second major tournament victory. Before coming to New Orleans, he came close to winning on two previous occasions. Walsingham took second place in an event at the Gulf Coast Poker Championship, held in 2007. He following year, he finished second in a tournament at the 2008 WSOP Circuit stop at Harrah’s New Orleans. This marked his fourth time to cash on the WSOP Circuit this season, following previous in-the-money finishes at Biloxi and Tunica. Two wins in four cashes – not bad, Mr. Walsingham. The player who finished in 27th place also deserves his own blazing headline. Doug “Rico” Carli cashed in this tournament, which normally might not be a big deal since that’s happens so many times in the past. But this marked Carli’s 50th career WSOP Circuit cash, which is the most of any player in history. Carli also catapulted up over 100 points for the first time and has a good shot to make it into the National Championship. If any player has paid his dues, so to speak, it is most certainly Carli, who has traveled around the country playing poker tournaments accompanied by his wife since 2005. This tournament was played over two consecutive days. After most of the starting field was eliminated on Day One, 36 in-the-money survivors returned for Day Two action. Final table play began with ten players on a busy Sunday night in the main stage of the special events center at Harrah’s New Orleans. Every table was filled to capacity with tournaments, satellites, and cash games. Tenth Place: H. John Park, a Korean-born poker player from Leesville, LA was the first player to be eliminated and finished in tenth place. He went out after losing a race with A-K against pocket tens. This was the very first WSOP Circuit tournament Park had played. He is a 62-year-old orthopedic surgeon. Ninth Place: Yong An, a 41-year-old poker player from Las Vegas went out in ninth place. This was his second time to cash at Harrah’s New Orleans. An also cashed once at the WSOP in Las Vegas. Eighth Place: Eli Loewenthal, a 24-year-old poker pro from Indianapolis finished in eighth place. He lost his remaining stack when an opponent had an ace and caught another ace on the flop, good for a higher pair. This marked Loewenthal’s fourth time to cash on the Circuit this season. Seventh Place: Loc Van Nguyen, a Vietnamese-born poker player from Houston ended up in seventh place. Nguyen lost to an opponent who had pocket jacks and flopped a set. This was Nguyen’s second time to enter a WSOP Circuit event. Sixth Place: Former WSOP gold bracelet winner Dan Schmiech finished in sixth place. 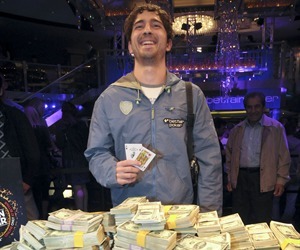 He won his WSOP title back in 2005, conquering the $5,000 buy-in Limit Hold’em event. Schmiech also finished 32nd in the 2006 WSOP Main Event, which was the largest live poker tournament in history. Schmiech now has more than $900,000 in career WSOP-related earnings. He is a 50-year-old former stock broker-turned-professional poker player from Houston. Fifth Place: Paul Odum, a probation officer from Canton, GA was the fifth-place finisher. Odum was eliminated when he lost all his chips holding A-T, which was topped by Brian Walsingham’s pocket queens. After scooping the big pot with two ladies, Walsingham held about two thirds of the total chips in play and appeared to be unbeatable. Meanwhile, Odum ended up with $19,808 in prize money. Odum won the 2011 Beau Rivage Spring Break Main Event Championship. He credited his great wife and two children who let him go out and play poker. Fourth Place: Tony Prusac would have most certainly been the story of this tournament, had it not been for Walsingham’s second gold ring victory and Carli’s 50th cash. If ever there was a player who nursed a short stack with precision and lasted far longer than expected, it was the 48-year-old dynamo from Houston. Prusac had only a few chips at the dinner break during the first day. He was desperately low on chips for the next six hours. He freely admitted he had no business making it into the money. Prusac not only clawed and scratched his way into the money, he also make it to the final table. Then, he stayed pretty much card dead for another three hours and coasted all the way to a fourth place finish. 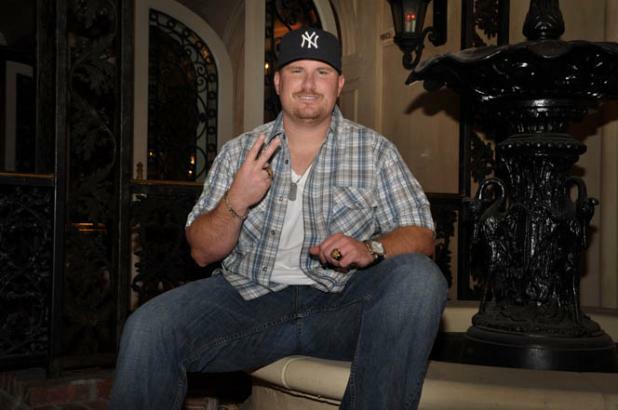 He later stated he is to be known publicly in the poker world as Tony “Short Stack” Prusac. Fourth place paid $26,295. Third Place: Allie Prescott, a longtime poker tournament veteran and high-stakes cash game player ended up as the third-place finisher. Prescott could take pride in returning to New Orleans, where he final tabled the 2006 Circuit championship held here at Harrah’s. Prescott is a graduate of Tulane University. He now lives in Memphis and invests in real estate. Prescott is working on his first novel, which is soon to be published. Third place paid $35,450. Second Place: Wayne Lawrence finished as the runner up. He is a 54-year-old self-employed man from Houma, LA. 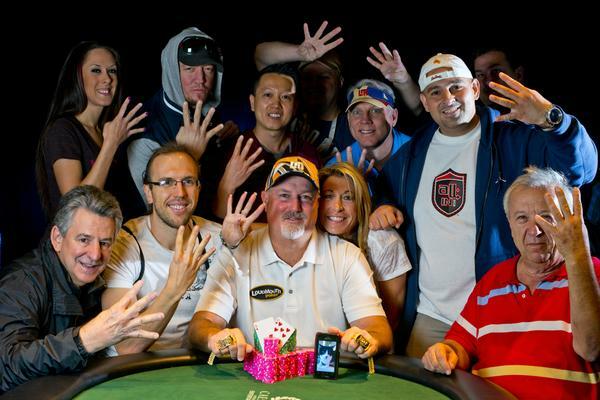 Lawrence has only played in one WSOP Circuit event, and he managed to make it all the way to second place. Lawrence received a payout totaling $48,594. First Place: Brian Walsingham is the latest WSOP Circuit champion. 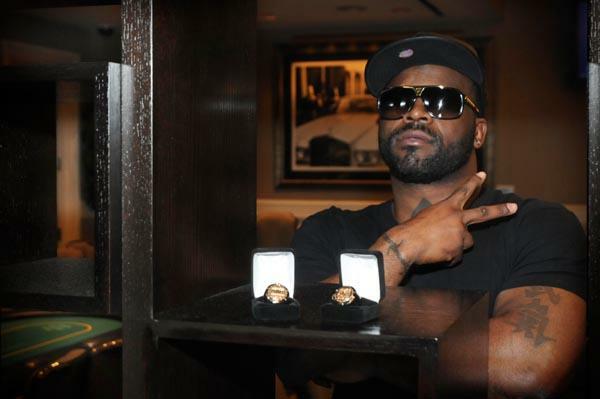 He earned his second WSOP Circuit gold ring at Harrah’s New Orleans. First place officially paid $78,604. The player who accumulates the most overall points in the ten gold ring tournaments receives a pre-paid entry into the $1 million 2010-2011 WSOP Circuit National Championship, to be held at Caesars Palace Las Vegas, next month. At least 11 players from Harrah’s New Orleans will qualify for the nationally-televised WSOP gold bracelet event. A FULL SCHEDULE of remaining events and those that have been completed (with results) at Harrah’s New Orleans can be found here. The first major poker tournament held at Harrah’s New Orleans was called the “Cajun Poker Classic,” which took place in early 2004. The three-day tournament attracted 536 players and inspired the casino to host more poker events in the future. Later that year, the first Bayou Poker Challenge was held, which consisted of six tournaments. Next, Harrah’s New Orleans became a charter member of the World Series of Poker Circuits, which officially started play in 2005. Since then, New Orleans has hosted the final stop on the circuit each year, which takes place in mid-May just prior to the start of the WSOP at the Rio in Las Vegas. The first two WSOP Circuit championships held at Harrah’s New Orleans were televised by ESPN and were among the most exciting tournaments broadcast at the time. They still occasionally appear in re-runs to this day. WSOP Circuit events in New Orleans proved to be so successful that a second tournament series was created, starting in 2007. This became known as the “Bayou Poker Challenge” (a.k.a. the Winter Bayou Poker Challenge), which has since become a December attraction. This tournament series is categorized as a World Series of Poker Satellite, since its Main Event winner earns an entry valued at $10,000 seat (plus expense money) into the WSOP championship, held the following year. RRRING!....RRRING!....HELLO, THIS IS GARY BOLDEN!